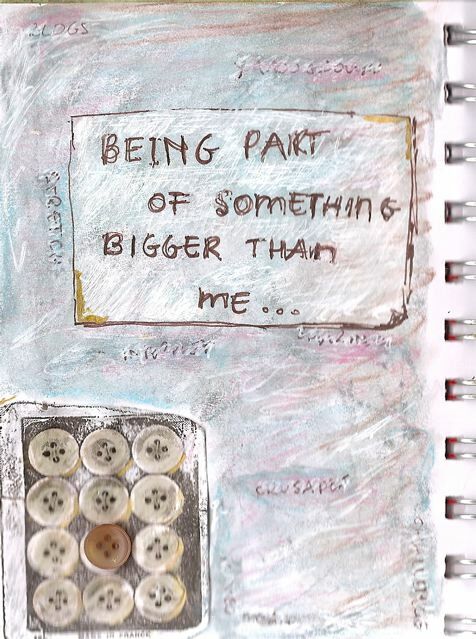 My daugther’s name was already on it, now is Tim Holtz’s name! 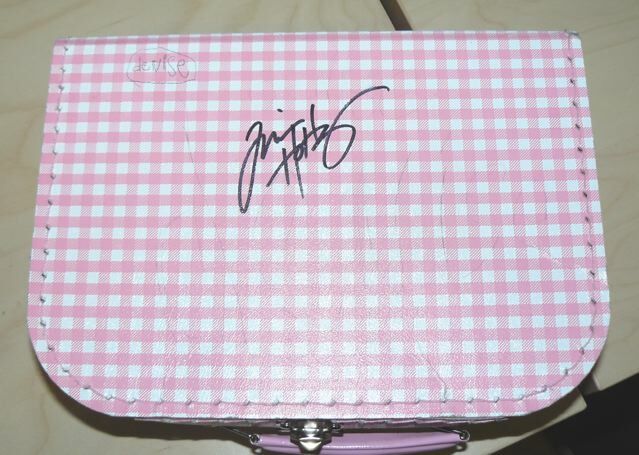 I saw him demoing here in Holland, and asked his signature! Okay, now my pages. I am such a weird person that journals everywhere. Okay, true: i start a page, and mostly finish it at home (because however filled my box how is, it always seems to lack a little something ;-)) I do not mind people staring or being curious (the most curious person is me, so what!). Funny: people do not often ASK what you are doing. Children do, I always like to make a little conversation with them. Most of them like a certain form of arts/crafting. Am I strange? Off course I am flattered when people like what I am doing, but if they do not it’s okay too. (Funny: i took an art class in the States, but made one painting too big for my suitcase. So i wrapped it in clear plastic and took it under my arm in the plane. Lot of people came to ask and see what it was. I was quite pleased with the results. One woman said to me: An art class? How interesting… You could see on her face that she could not believe I took a transatlantic flight to make that painting LOL). Well, that was it for now!! 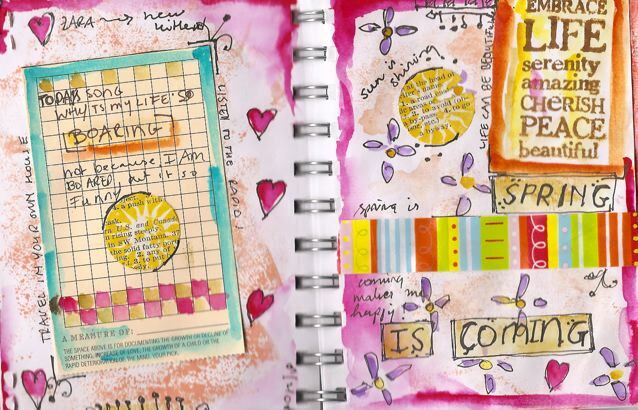 I am working on a project which is related to how i started journaling, when it is finished i will show it here. 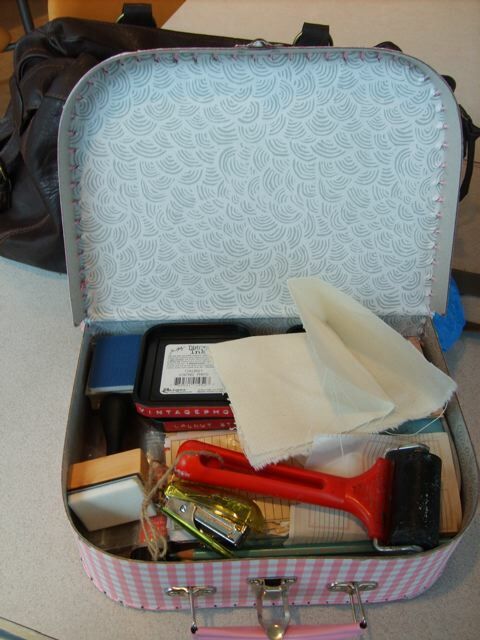 I made a travel kit for Michelle’s crusade of february. 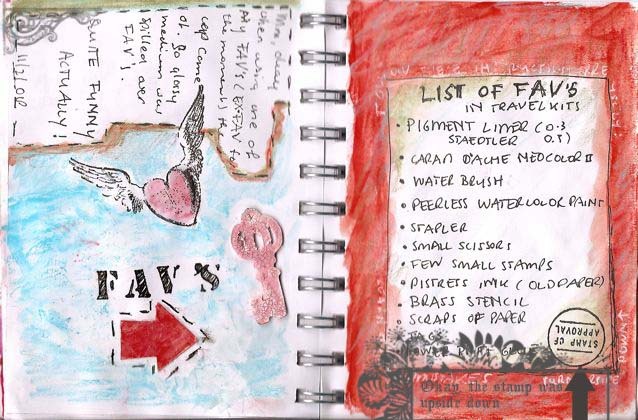 And it inspired me to make new journal pages in my travel journal. Also because my travel journal is smaller then my regular, and well… because of this crusade off course!!! 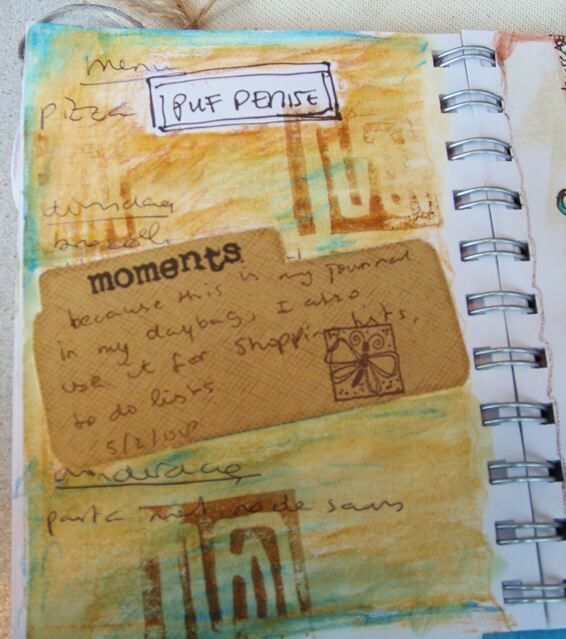 I visited the other participants weblogs or flickr pages and WOW i can recommend that… You will get tons of ideas for journal kits and for journaling. 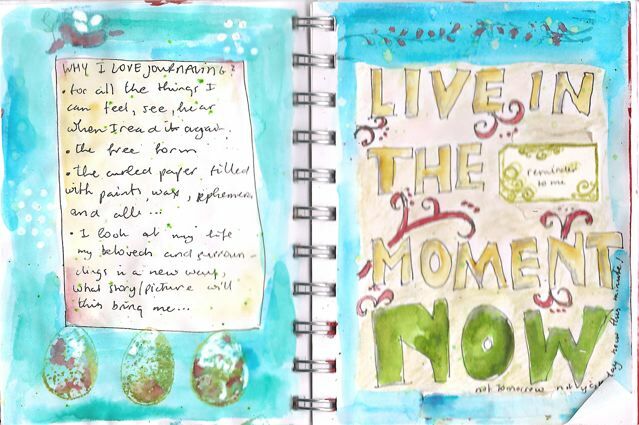 I just have to admit that journaling for me is not a way to work on ideas for other art, like paintings. I just journal to keep record at a very personal way. It enables me to relive moments of the past. Most joyfull times, sometimes sad or hard times. Okay, enough, here are the three pages I made this week. Sun was shining, it felt like spring and I was inspired by Hannah and Audrey to use more vivid colors then I usually do. 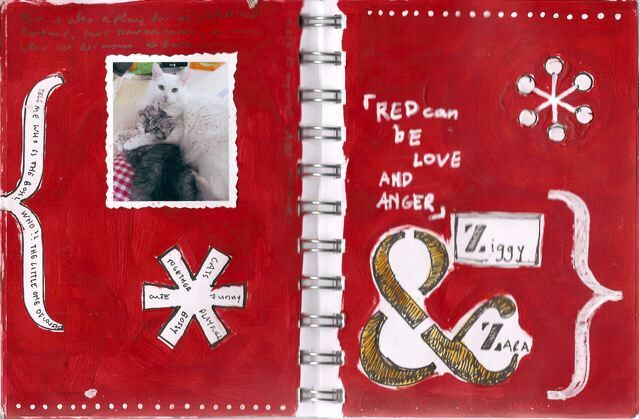 So I made this journal page. 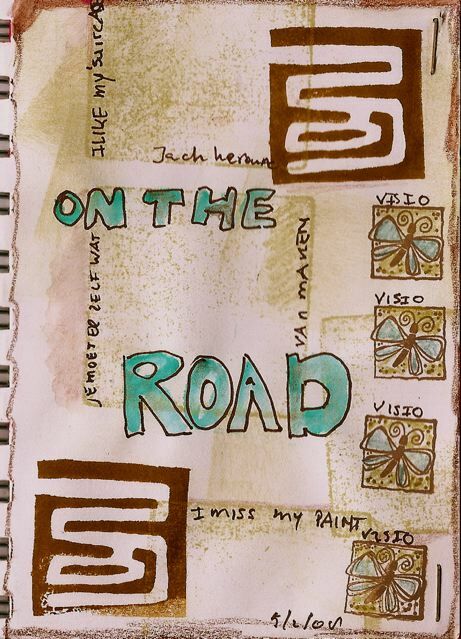 Did I tell you already i love stamps and peerless watercolors while On the road? This is this month Crusade from Michelle Ward. Ooh my, really wanted to join december and january, but found no time at all ;-( (some reasons were good, because it was busy running my own bussines, some reasons were less pretty, since we had a majore leak in the kitchen and had to renew floors). But HEE now I am here! Let’s see what I have? 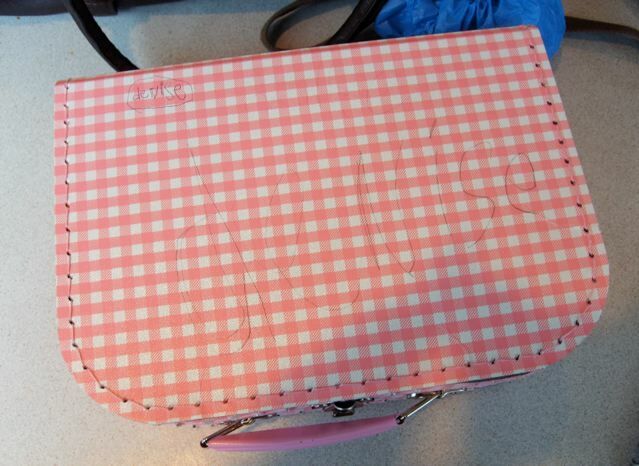 I lend this from my daughter Denise (if you look carefully you can see she wrote her name on it). I admit: I have a problem in choosing. 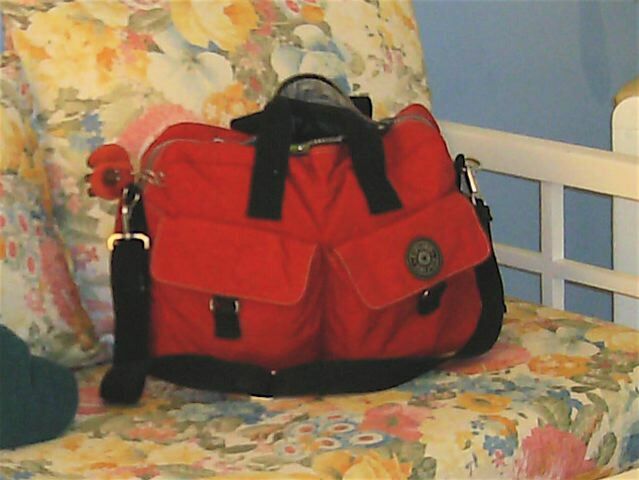 So this is for short trips (to the pool with Denise for her swimming lessons f.i.). 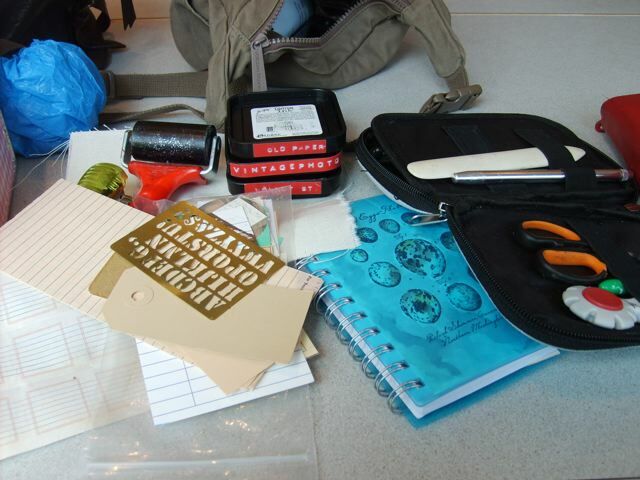 I have a big bag when I go on holiday and I put a lot in it (even a paper cutter, which I really have a lot of fun of). 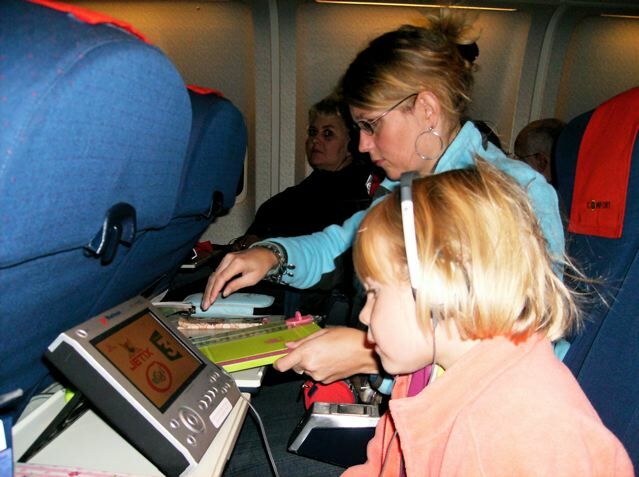 Here you see me ‘working’ on the plane. Okay, what do I take with me??? Whats in IT? 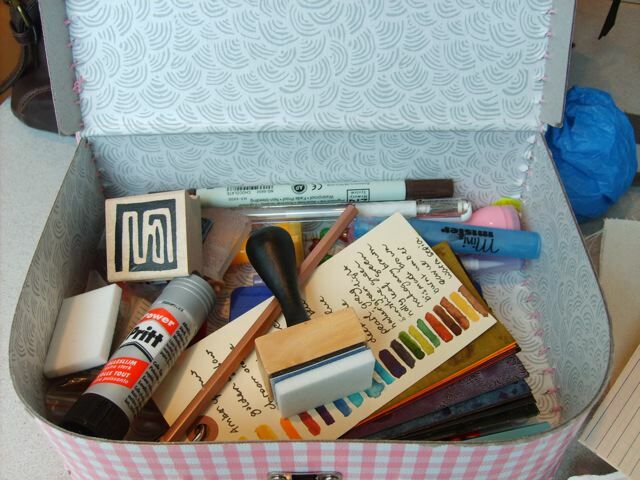 I have stamp (few), scissors, bone folder, pens, watercolor crayons, a brass letter stencil, a small journal, some inks (distress ink) water brush, tags & labels, small brayer, metalic pencils and (I forgot that today to the pool) some paper towel to wipe of hands and stamps. It is funny to journal everywhere. People are very curious to what you’re doing, but don’t dare asking. But it is not a secret, I doodle and write and scribble a little.